Photo measuring approx 2.5 x 4.25 inches. It is one of four photos glued to a section of black paper that has been presumably removed from a vintage photo album. No information. The other photos on the page are of similar vintage, all showing children outdoors. It was a busy, social weekend of catching up with friends at the theater, a party, etc. I got to see my friend Christine (“harriedcostumer”) twice, and got to hang out with my friend Jenn. In addition to the pleasure of their company, they both surprised me with gifts of vintage photos! So I’ll post a few in the coming days. Here’s one that Christine gave me. It’s a bit blurry, but I love it for the way it grows more amusing as you look at it. 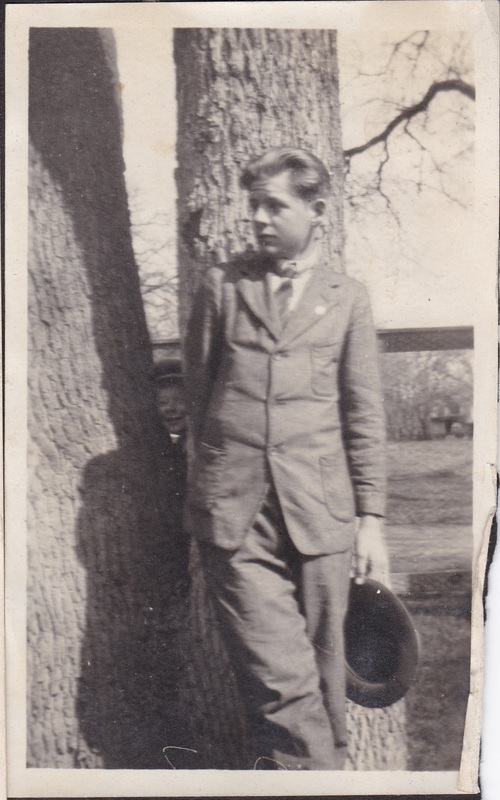 At first glance, it’s a boy or young man affecting a languorous pose, hat doffed, against a tree, apparently feeling handsome in his suit. But the poor guy’s suit seems to fit awkwardly, straining at the buttons, resulting in a look that is no doubt exacerbated by the angle of the sun. Adding insult to injury, an impish face can be seen peeking out of the crook of the tree, ruining whatever mood this fellow might have managed to create. The suit is very ill fitting. It’s also wrinkled, and the sleeves are too short, almost as if he were trying to play dress up and feel like a grown up. I suspect it was a suit that he’s grown out of, but the family can only get a new one every two years or so, no matter what growth spurts happen. Let’s hope he didn’t have to wear it every day! Glad you like it! I also get the feeling it’s one he outgrew. Maybe he’s growing too fast for his parents to keep up with clothes. Maybe it’s a suit he was always told looks great on him, so he has a hard time parting with it. Maybe he packed on some pounds over the holidays. Who knows? Either way, he seems content.